There is not a Nobel Prize specifically for crystallography, but the science has contributed to or been associated with numerous Prizes awarded in the fields of Physics, Chemistry and Physiology or Medicine. 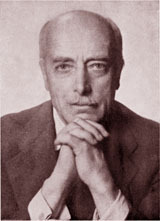 The International Year of Crystallography in 2014 celebrates the 100th anniversary of the award of the Nobel Prize in Physics to Max von Laue for his discovery of the diffraction of X-rays by crystals. Source: International Union of Crystallography/Nobel Institute. Crystals have fascinated people for millennia. 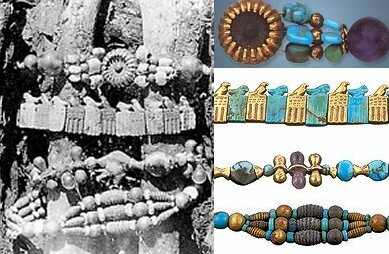 The Egyptian Queen Djer (ca3000 BC) had turquoise jewelry. The Greeks and Romans studied naturally occurring crystals. Scientists from the 17th-19th centuries classified crystals and mused over their composition, physical properties, shapes and internal arrangement. The concepts of symmetry and space groups were derived well before the discovery of X-ray diffraction. Modern crystallography developed rapidly following the seminal experiments of von Laue and his co-workers in 1912 and the Braggs in 1913 and is a key cornerstone of science today. In the last 100 years, many Nobel prizes have been awarded to people involved with the development of crystallography or its use as a crucial tool in the investigation of the structure of materials, chemical compounds and biological systems. This timeline depicts some of the important milestones in the study of crystals and the development of crystallography over the ages. Source: Rangana Warshamange and Anthony Linden, Institute of Organic Chemistry, University of Zurich. In the hundred years since the discovery of X-ray diffraction from crystal lattices, the Royal Institution in London has played a central role in many crystallographic discoveries of the utmost importance. In 1912-13, following early work by Max von Laue, William Henry Bragg, with his son Lawrence, worked out how to determine the structure of crystals using X-ray diffraction patterns in 1912-13. The pair were awarded the Nobel Prize in Physics in 1915 and Lawrence Bragg remains the youngest ever winner. 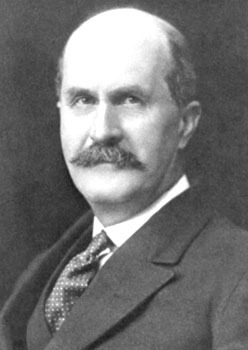 William Henry Bragg took over the Directorship of the Davy Faraday Research Laboratory (DFRL) at the RI in 1923, upon the death of James Dewar. Dewar had refused to retire and by the time he died the laboratory had almost ceased to function. This left effectively a blank canvas for Bragg to work with and he used the opportunity to build up the world's leading X-ray crystallography laboratory, modernising both the structure of the team and the laboratories themselves. At the RI he built up a formidable team of crystallographers who went on to make significant contributions to the subject in their own right and to teach others. Bragg's students included Kathleen Lonsdale, Dorothy Hodgkin and J. D. Bernal. Lonsdale's work was particularly significant to the RI as in 1925 she determined the structure of benzene, a century after Michael Faraday had identified it as a substance. Source: The Royal Institution, with funding from the Science and Technology Facilities Council. An elegant larger version of this timeline can be seen on the Royal Institution website. The modern science of crystallography has its roots in the 16th century, at a time when morphological studies of minerals and other naturally occurring crystals gave rise to early investigations into symmetry. Later researches explained the relation between the external symmetries of a crystal and its structure at the atomic level. This timeline traces the development of this branch of crystallography through relevant entries in the scientific literature up to 1970. Source: Lima-de-Faria, J. Editor. (1990) Historical Atlas of Crystallography. Dordrecht: Kluwer. Some of the remarkable physical properties of crystals were discovered centuries ago, such as the sparkle and colours of gems, the hardness of diamond and its use in carving jade and rock crystals, or the hardness of carborundum and its use by ancient Egyptians for making holes in granite. The optical properties of crystals began to be studied in the 17th century. Since then, crystal physics has advanced by leaps and bounds, especially once the internal structure of crystals at the atomic scale became established through the use of X-ray diffraction. The term chemical crystallography encompasses a broad range of topics. These include the behaviour of the total crystalline phase, all ramifications of chemistry, phase equilibria and thermodynamics, and whole disciplines such as mineralogy, structural chemistry and solid-state physics. Laue's discovery of X-ray diffraction from crystal lattices a century ago, and the pioneering work of the Braggs and many co-workers in calculating the lattice structure from diffraction patterns, have given us the most accurate view we have of molecular structures and conformations. However, because phase information is not available in a diffraction pattern, the solution of crystal structures is challenging, and has required extraordinary insights and cleverness to allow us, nowadays, to determine routinely the structure of large biological molecules containing tens of thousands of atoms. This timeline illustrates significant milestones in crystallographic publishing, database development and information management. 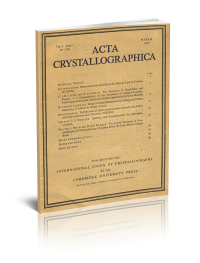 Included are a number of early publications which were influential in establishing the study of crystals as a scientific discipline. Source: International Union of Crystallography; early books from the Book Exhibit Crystallography - Defining the Shape of the World, Commemorating the 100th Anniversary of the Discovery of X-ray Diffraction, by courtesy of the Rare Book & Manuscript Library of the University of Illinois at Urbana-Champaign..
A sheet of perforated postage stamps is a typical example of a plane lattice tiling - the type of symmetry (in two dimensions) that is matched by the three-dimensional structure of a crystal lattice. Perhaps this is one reason why there are many crystallographers who appreciate philately - the study of postage stamps and their history. Commemorative stamps from countries all over the world illustrate historical events, often in miniature works of art of great beauty. 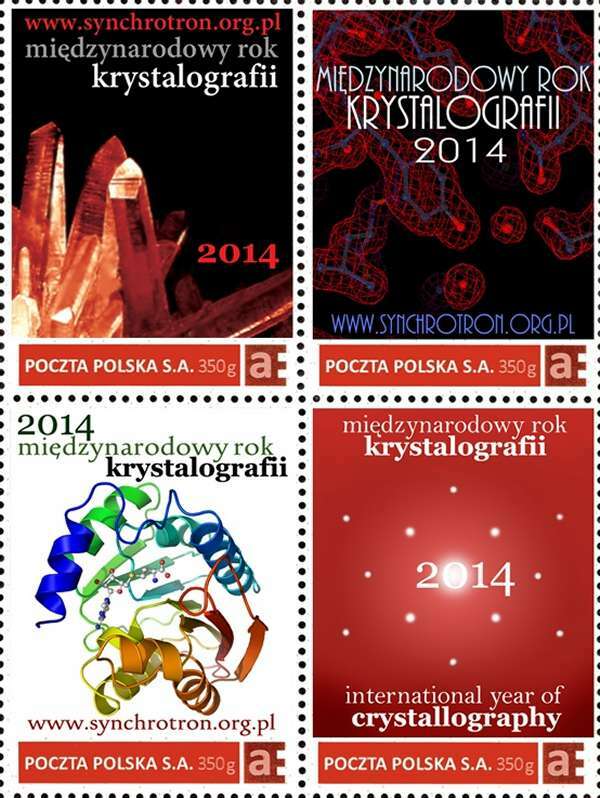 Many stamp issues have illustrated crystallographic experiments, scientific results or individual scientists. This timeline highlights some of the most noteworthy and beautiful examples. Source: original presentations by: Daniel Rabinovich, U. North Carolina at Charlotte, USA; Santíago Garcia-Granda and J. Montejo-Bernardo, U. Oviedo, Spain; and Jagannath Mani, Bangalore, India. Timeline implemented by Danny Hoare, Alun School, Mold, Wales, UK.